Zoku’s double-wall suspended Glass Core Bottle is the perfect balance of health, style, and durability. Fill them with your favorite hot or cold beverages and enjoy the flavors in their crispest form—fresh from this pure borosilicate glass bottle. Glass, thread-free mouthpiece will not hold flavors—freeing you to switch between beverages. The strong, triangular tessellation found on the silicone pads protects the bottle from bumps and drops. Take your bottle everywhere without the worry of spilling it! 1/4-turn locking cap system is leak-proof and worry free! Protect the flavor of your beverage in a pure borosilicate glass bottle without the worry of shattering it. The strong, triangular tessellation found on the silicone pads protect the bottle from bumps and drops. Glass, thread-free mouthpiece will not hold flavors—freeing you to switch between beverages. 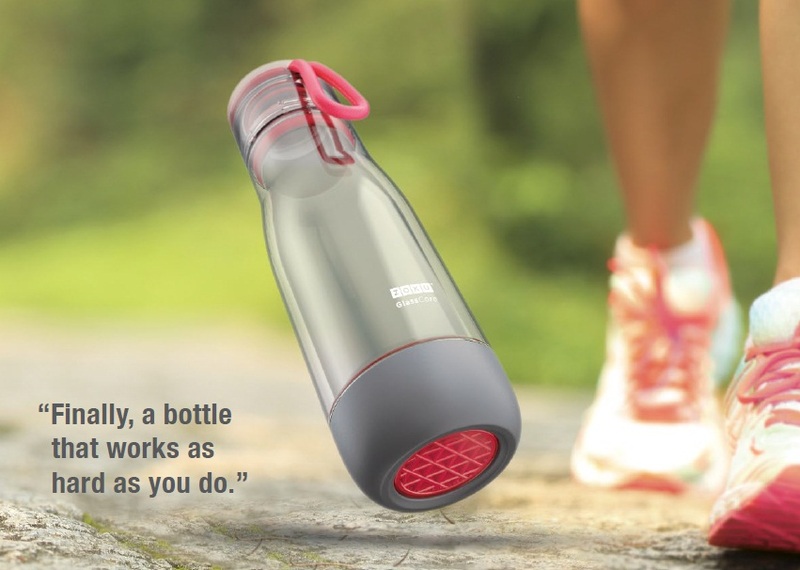 Take your bottle everywhere without the worry of spilling it! 1/4-turn locking cap system is leak-proof and worry free. Textured fitness cord is easy to remove from the cap to clean and is comfortable to carry. Available in the Active and the Everyday Range and in either 355mls & 475mls.